We are ecstatic to announce to that Kumbura is now a bona fide member of the Camp Jabulani herd. 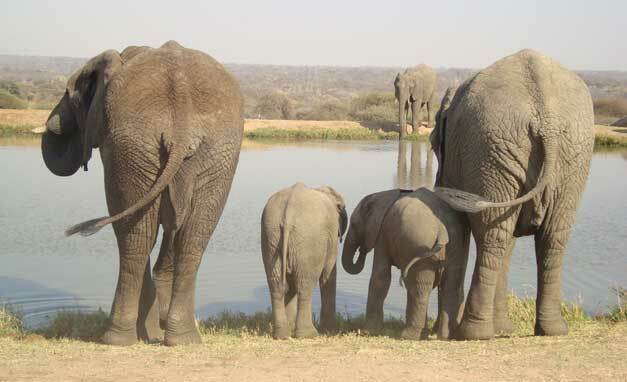 We experienced this firsthand last week, when the elephants banded together in her defense. Kumbura had a small, round nodule growing from the left side of her trunk for the past few months, which was getting progressively larger. Since Dr Rogers was at the stables vaccinating the bulls, we decided to have him remove her ‘beauty mark’ at the same time. After her successful surgery, little Kumbura woke up to find herself surround by strangers. She got such a fright that she took off towards the stables, which happened to be in the opposite direction to where the rest of the herd was waiting for her. As she ran off trumpeting, all the elephants immediately began bellowing and rumbling as they went after her. Munyati – one of the large bulls – stopped long enough to glare at us with ears billowing wide – which is elephant speak for I’m REALLY not pleased with you! – before running after the others. Once they’d caught up to her, Kumbura was quickly subdued and reassured. We were so proud and moved by the love and devotion the herd showed this little former outsider. By late morning she’d recovered completely from her ordeal, and was happily playing again the rest of the babies. They were all quite intrigued by her bandage, and you could almost hear them asking, “What’s this?” as they took turns tugging on the end of the tape. Needless to say it didn’t take her long to lose it, despite it being securely placed. She’s healing nicely, but is still a little wary of people. Mischievous Zindoga – our oldest bull calf – had his third birthday on the 25th of September. We celebrated this momentous occasion with carrots and bananas. The little guy gets so crazy about food that we decided to hold the birthday party in the stables, lest he start a food fight among the rest of the calves. We sang to him and fed him his birthday treats. All in all it was a happy affair. Jabulani has taken to wearing a strip of his stable padding around his neck. He enjoys putting it on (much like a gentleman would wear a scarf underneath the collar of his overcoat) and standing there. He also keeps himself amused in the mornings while he’s waiting to be let out for his daily routine. He plays with the strip, and sometimes even tries to wrap it through the poles of his stable. I often wonder if he’s trying to tell me something with these antics, or maybe it’s just that he’s a born performer. Please keep the amazing tales coming, it makes me feel like I am back there! Loads of love to everyone and all the Ellies! ps: any news on Joe? Fabulous stories, do you have any pictures to go with them? I absolutely love hearing about the antics of those wonderful elephants! Please keep sharing with us. It’s like being there all over again!